Stephanotis is also known as Madagascar Jasmine and is small, star-shaped, and sweet-scented white flowers commonly used for wedding flowers. Our flowers are packed in boxed of 25 and available year round. When arranging them, note that special wiring techniques are required for design work. They have vase life of about 3-4 days so we recommend scheduling your delivery for one or two days prior to your wedding or event. They are fresh cut and can also be used for hair adornment, bridal bouquets, boutonnieres, wedding cake toppers, among other uses. The stephanotis jasmine is gorgeous little beauties which are also known as the Madagascan jasmine. In many places,this flower is famously known as the stephanotis floribunda. This flower is unique as it has got that lovely classic white starry bloom against glossy green foliage. It's a reallyclassic flower and is loved by most of the florists around the globe. One of the reasons for the immense love that this flower receives is its exquisite scent. This flower is really popular and is widely used in wedding bouquets and boutonnieres. One more reason for this flower being preferred in the floral wedding arrangements is because stephanotis jasmine is meant to symbolize marital happiness. Stephanotis Jasmine is a climbing plant which is native to Africa, Madagascar, and parts of Asia. And because of Madagascar is one of its origin places, the flower came to be known as Madagascan Jasmine.The stephanotis flower loves a tropical to sub-tropical climate. This flower hates frost. So, if you are planning to use these flowers in your wedding and your wedding destination is a cold place, you need to give these flowers a little extra protection as they are susceptible to frost. These are beautiful pristine white tubular flowers that belong to the epicene family, and so they aresomewhat related to the Hoyas. The fragrance of their flower is enough to the draw the attention of the attendees of the wedding and leave them mesmerized with a refreshing andpleasant aura. While using the stephanotis Madagascar jasmine what for any floral arrangement what should be kept in mind is always to keep the stem of the flowers intact which is vital to keeping those pretty white buds fresh in your wedding floral arrangements. 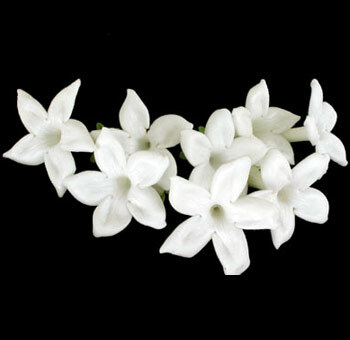 The stephanotis jasmine has the power to encapsulate any person which their breathtaking fragrance. The fresh white color makes them a favorite choice for the wedding décor. The stephanotis bouquet and boutonniere are known to enhance any wedding decorations and is every bride’s favorite. When these beautiful white tubular flowers are combined with any other flowers or foliage, they completely transform the whole floral arrangement from ordinary to extraordinary. Along with the decorations, these flowers are known to be perfect for bridal bouquets and boutonnieres as well. If you are planning to do a DIY stephanotis bouquet and boutonniere always make sure to leave the stem of these flowers little longer for the fact that it helps in the properly tying these flowers in the arrangement. Tie a bunch of five to six Madagascar jasmines together and add some greens to it. This arrangement makes up for an exquisite and straightforward bridal bouquet. If you wish to go for something extravagant and fancy, you can club these pretty little white tubular flowers with a bunch of roses. All you have to do is make a whole bunch of pink, peach or white roses with 10-15 flowers and add these stephanotis jasmines in between to fill up the gaps. This arrangement when completed gives your floral arrangement a fuller look and adds to the beauty of the final piece. An absolutely extraordinary and beautiful thing to do while making a stephanotis bouquet and boutonniere is to invest in some pearl headed pins whether colored or white to create that finished look for your stephanotis once it is in your bouquet. Be very gentle with the petals of the flower as they are very delicate, and you would not want to spoil these pretty little creations. Widely used for bridal bouquets and boutonnieres, stephanotis Madagascar jasmine flower enhances the beauty of any floral arrangement. Madagascar jasmine flower can be found at very few pieces for sale. One such place from where you can buy Madagascar jasmine for sale is WholeBlossoms. Known for their quality and timely delivery, they are amongst the best flower dealers in the United States. Before shipping the flowers to the final destination, they prepare the flowers for their journey by following proper hydration methods. They provide a valuable service by giving shoppers access to fresh flowers online that can be delivered just about anywhere at any time that too quickly and quietly. Their large network of professional workers and their specially picked flowers allows them to ensure that they deliver nothing but the best locally and globally. So, if you are looking for any online florists who can help you with fresh flowers for wedding arrangements, this is the best place for you. They also ensure their customers a cut above the rest at unbeatable prices. If anybody can provide you with a rare flower like Madagascar jasmine for sale, they have got to be the best!